The Bella range of fitted kitchens are beautiful in every way. 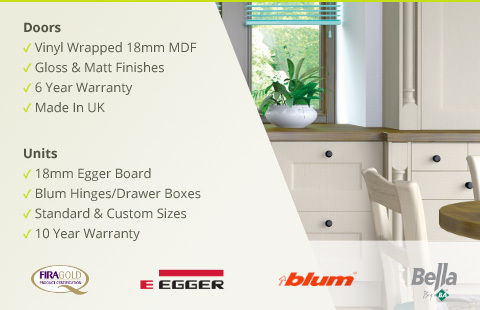 They are made to the highest standard from 18mm MDF, vinyl wrapped with matching backs. One continuous piece of vinyl covers the face and edges giving a high quality durable finish and Bella doors pass the FIRA Gold award test for excellence in furniture. You can choose virtually any design with any finish. We have over 20 door styles and approximately 35 colour finish options in this range, so we’re sure you’ll be able to find a kitchen door combination that will suit you in every way. These Bella kitchen cabinet doors and drawer fronts are available in both standard and custom sizes as well as with glass effect frames and inserts. See the Bella vinyl accessories section for matching curved carcasses and curved kitchen doors, plinth, cornice, end panels and more.